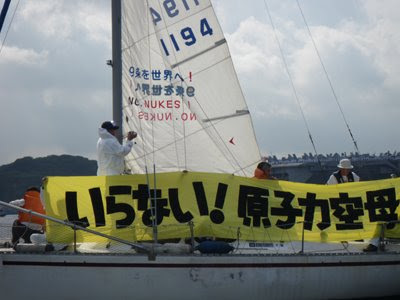 "Let's stop the SDF's fuel supply activity in the Indian Ocean." 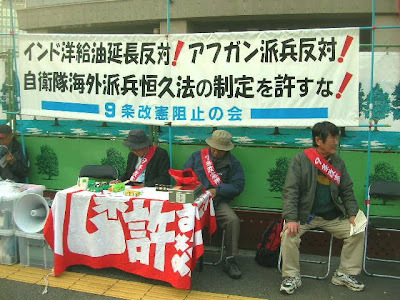 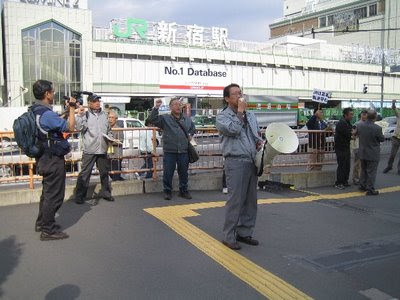 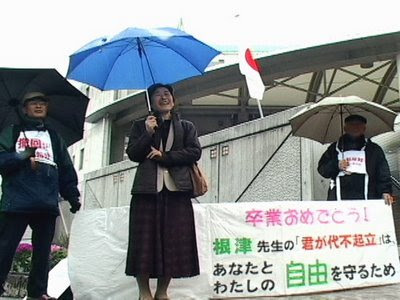 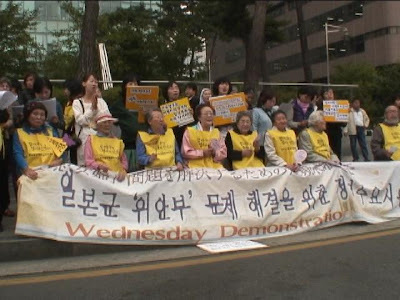 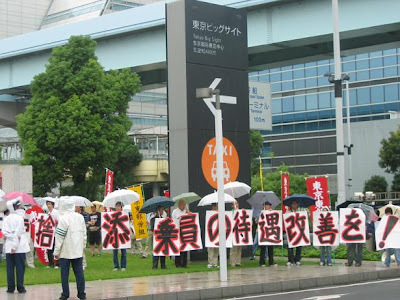 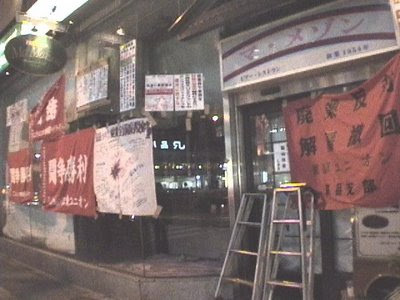 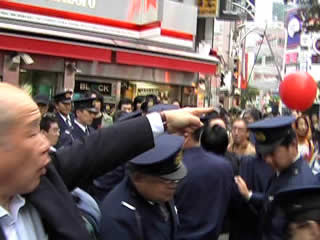 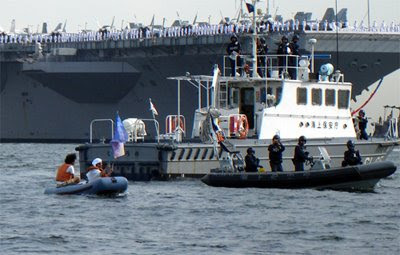 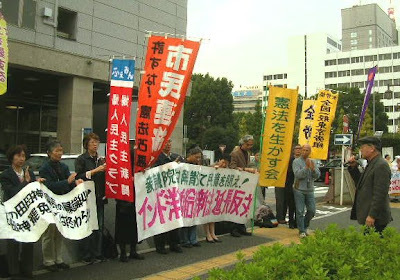 On October 14, the Article Nine Revision Blocking Association formed by the Zengakuren/Zenkyoto generation resumed sit-in protest in front of the Diet building (see photo). 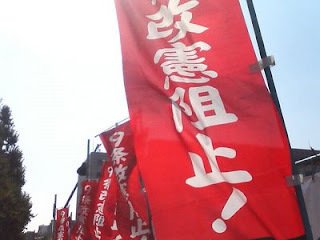 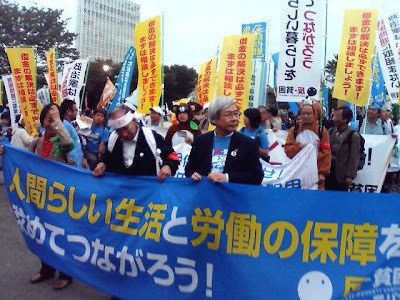 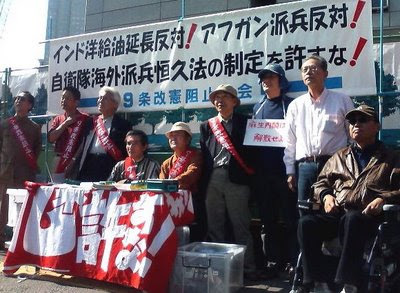 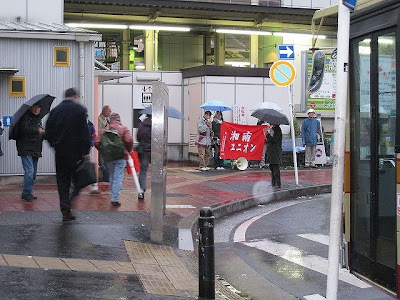 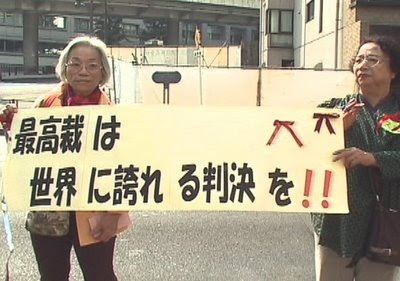 Forty members participate every day with appeals, "Put an end to the Aso administration that aims to make preemptive revision of Article 9" and "Democratic Party of Japan, don't use the bill for extending the new fuel supply law as a bargaining tool for Diet dissolution." 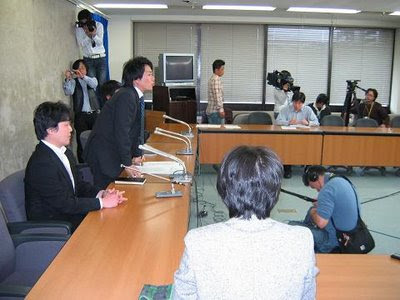 In the House of Representatives, a session started for deliberation on the New Anti-terrorism Special Measures Law (New Law for MSDF Refuelin Activities in the Indian Ocean) on October 10, making the political situation tense as the law is to be sent to the House of Councilors after its adoption in a plenary session in the House of Representatives on 21st at the earliest. 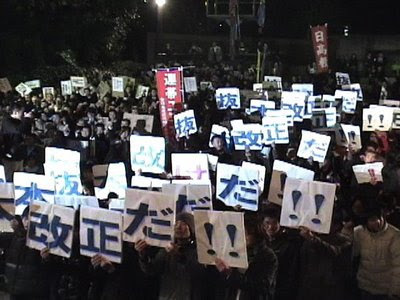 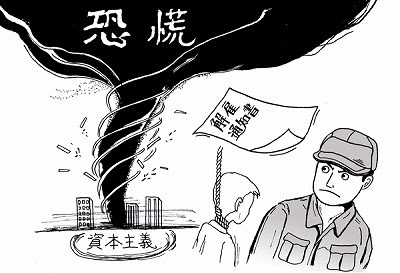 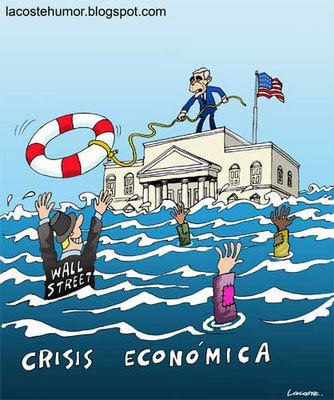 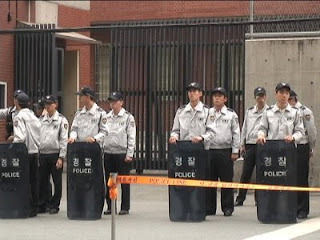 On 20th, citizen groups and labor unions will stage an emergency action in front of the Diet building. 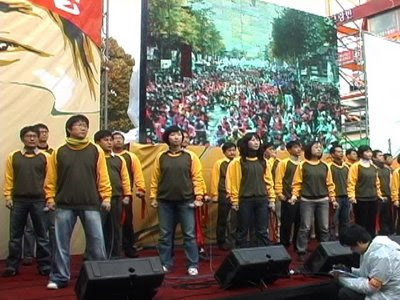 See homepages of the organizations involved. 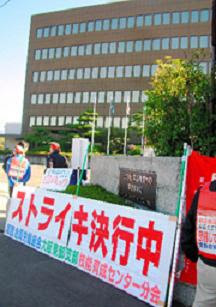 Concerning the revision of the Temporary Staffing Services Law, the seedbed of the working poor, the Labor Policy Council made a proposition on September 24 to the Ministry of Health, Labour and Welfare. 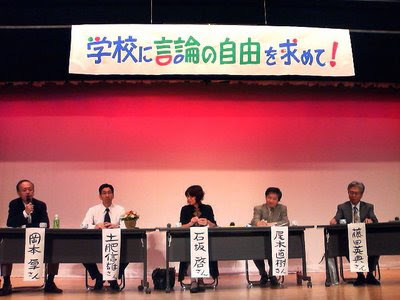 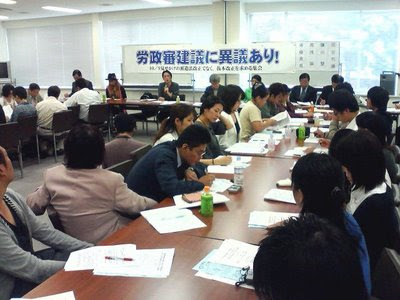 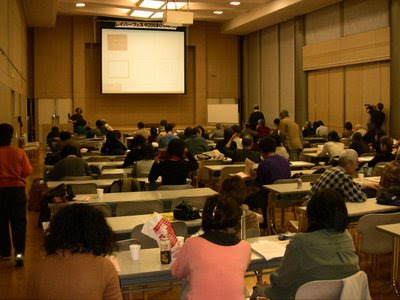 In opposition to the proposition, citizens and some Diet members had a meeting on October 9 in an Upper House conference room. 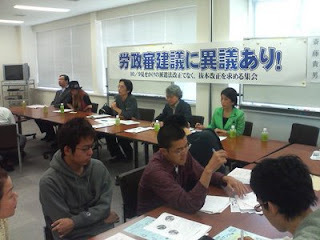 The room was more than full of 150 participants from labor unions and the media. 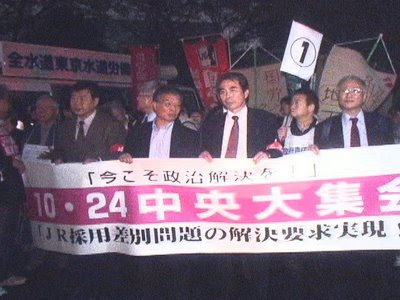 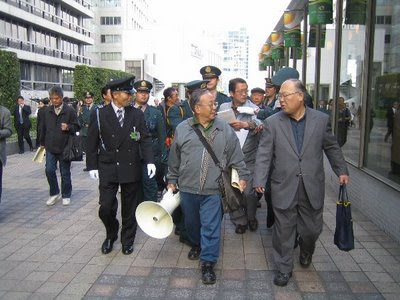 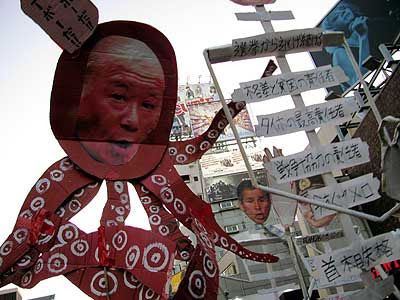 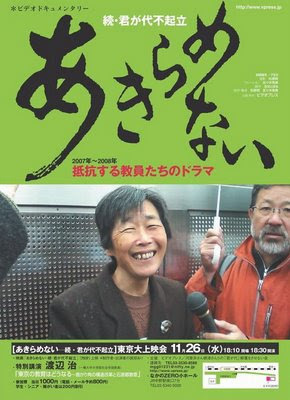 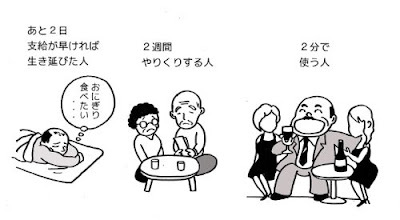 In relay talks, Satoshi Kamata, Takao Saito, Makoto Yuasa and Karin Amamiya emphasized before anything else the need for a move to change the basic framework of the gap-widening society while revealing that the Labor Policy Council's proposition could never remedy the situation in any sense. 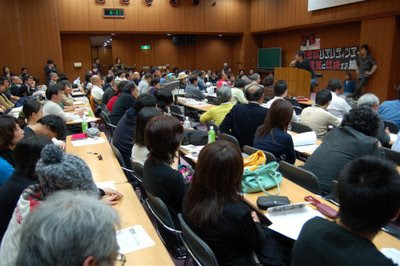 In this meeting, there was also an appeal from a member of the newborn union of detached cabin attendants for Turkish Airlines concerning the actual state of the disguised contracting practices involved. 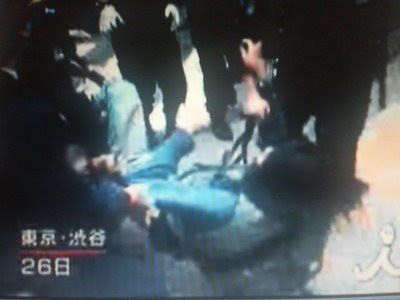 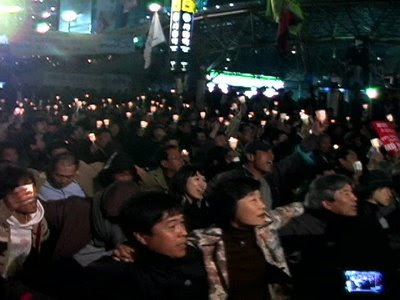 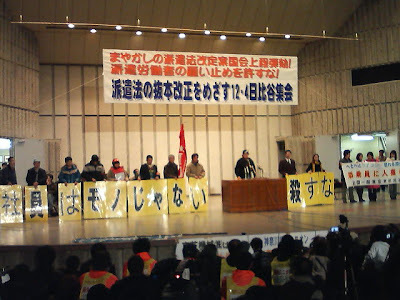 In concluding remarks, Asami Nakano from the Dispatched Workers' Network said with anger, "Today's talks have made me convinced that the Labor Policy Council's proposition must be smashed, not protested." 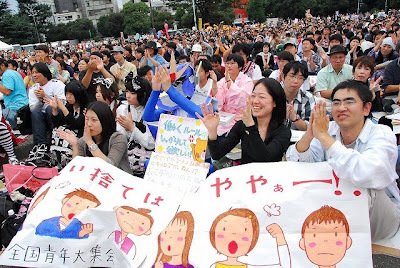 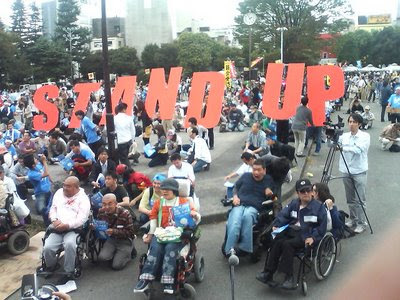 On October 5, National Youth Grand Rally 2008 for Job for Decent and Humane Life was held in response to the call from the Metropolitan Youth Union and Zenroren (National Confederation of Trade Unions) Youth Chapter among other organizations in Meiji Park, Tokyo, making a great success by attracting 4600 participants. 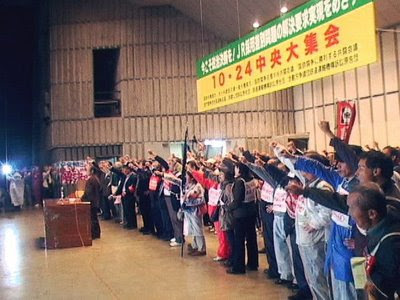 Young workers gave talks from the podium, representing those struggling against disguised contracting by Panasonic Plasma Display Co., Ltd. (renamed from Matsushita Plasma), Nichia Corporation and Canon. 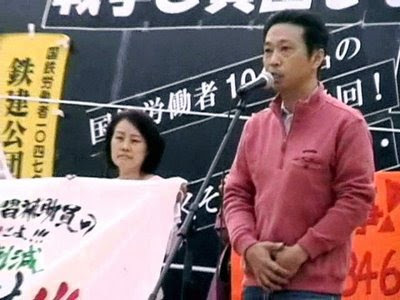 The rally received solidarity speeches from Kazuyoshi Ikeda from Gaten-kei Rentai (Japan Construction and Transport Industry Workers Solidarity Union), Chie Matsumoto fighting against the disguised contracting by Herald Asahi, Makoto Yuasa from the Anti-Poverty Network, Karin Amamiya, an author, among others. 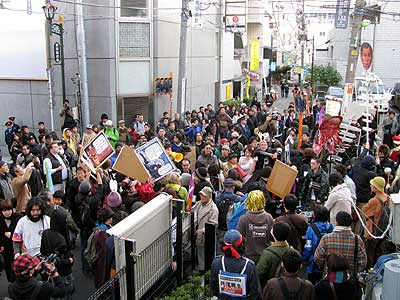 A youth rally of this size is epoch making and the first one focused on the youth employment issue. 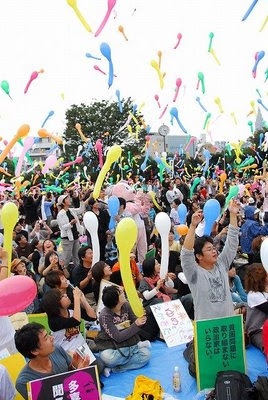 The rally promised further surges of anti-poverty campaign driven by young people. 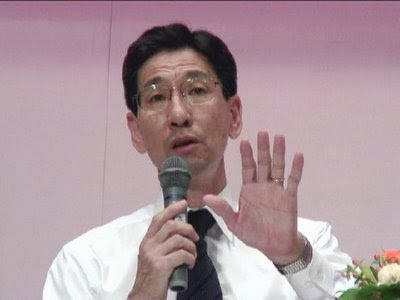 Reporting: Makoto Kawazoe. 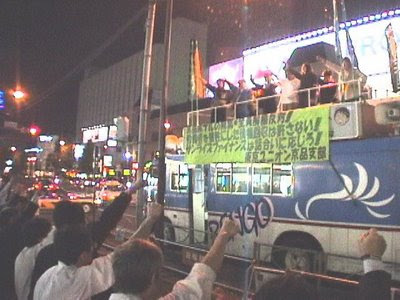 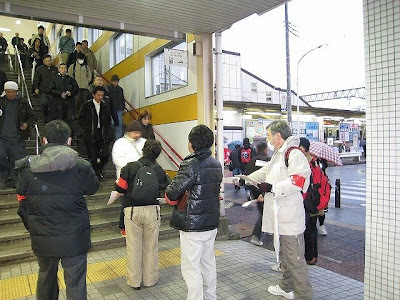 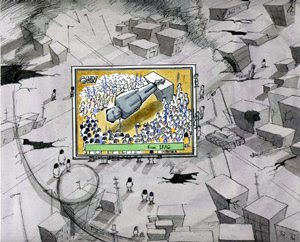 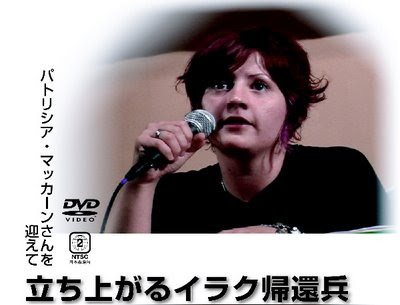 See Metropolitan Youth Union HP and Animation (Kyoto Minpo).